This Day in History: On April 3, 1860 the Pony Express began. It was an American mail delivery service that used horses and young riders to deliver mail across rough terrain as fast as possible. It only lasted 18 months. This lunch did not turn out as I had imagined. I think that the horse is the problem (and lack of a rider). My horse cookie cutter was not running, it was standing so I used a unicorn cutter and cut off the horn. But this lunch tasted delicious and it was fun to eat the cute apple slices. 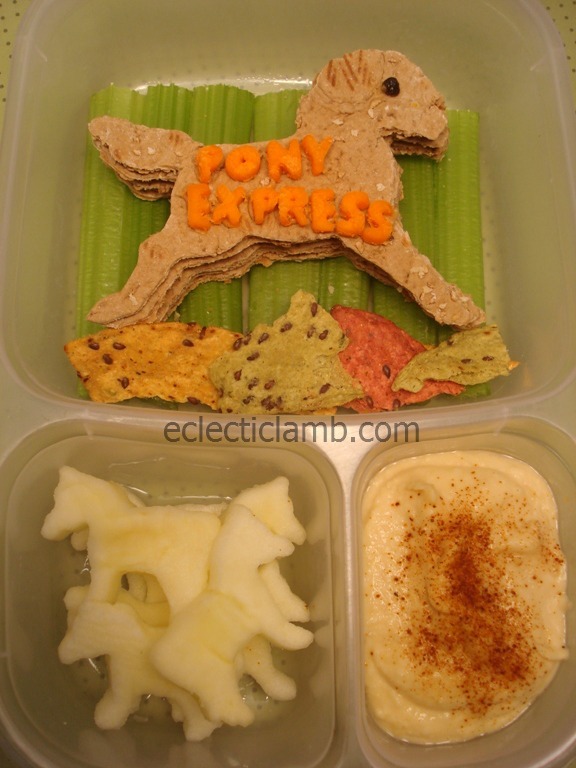 This entry was posted in Bento / Cute Food and tagged bento, pony express, This day in history, vegetarian. Bookmark the permalink. I love it! Maybe I could get my picky-eater grandson to try this. Sometimes it isn’t the food, it’s how a five year old perceives it! Thank you! You are right. Interesting bit of history, and great lunch! I love it! I think it is a very fun bento an that the horse looks great… it probably threw its rider! I love your flat bread horse!